The Litter Robot LRII Self Cleaning Litter Box is really going to appeal to you if you never want to scoop dirty litter ever again. And I bet that most cat owners would prefer never to do this job. It is definitely the least glamorous part of cat ownership. I am honest – I really hate scooping litter. And when you are out at work all day you have to scoop in the morning and evening. Also if you live in a multi-cat household you really need one box per cat. So when I had four cats – that was four litter boxes scattered through the house. Not very nice when I had visitors as each bathroom had a litter box. Even when I became just a two cat household I still ended up with four litter boxes. Why? Well I found that Dyson refused to use a litter box if it had previously been used, either by her or my other cat. So after one wee she would then want a new clean box for her subsequent poo. This was easy enough to manage when at home but if you are out for 12-13 hours then you get the picture. The other thing I was finding was that each morning or evening at least one litter box was tipped over. Therefore, litter was scattered everywhere (and some not so nice items). I finally managed to work out what was happening. Dyson would not go fully into a litter box. Instead all four of her paws would be on the edge of the box and only her bottom would be over the litter. How she managed this balancing act I do not know. But as she is a heavy cat (about 12 lbs) she would often tip the box over. So I had been interested in automatic litter boxes before this but now I thought it was best that I invested. So I started my research. The one thing I found out straight away is that with most self cleaning litter boxes you had a high initial investment in the box itself but then you had to keep investing. For example, you had to buy special bags or a special litter (from silicon pellets through to self cleaning litters). So the costs kept going up. I had seen the Litter Robot mentioned on a forum a few years previous and initially the higher outlay put me off buying it. But, one thing stood out – there was no real extra outlay after this. It took regular clumping cat litter, so I could keep my usual World Best Cat Litter. And you could just use regular sized garbage bags (8 or 13 gallon will work). The only extra expense would be changing the carbon filter every 6-8 months. As I had to do this with a standard covered litter box this did not seem like an extra outlay. And after working it out I realised that over a few years lifetime of an automatic litter box that this would cost about the same. So you are probably hoping I get to the point of this review and here it starts. Yes I ordered one. I was expecting the litter robot to be big and oh boy I was not wrong this was large. Totally this measures 24 by 22 by 29 inches. So you do need somewhere with a bit of space to put it. But you should in the long run then not need all the other litter boxes around your home. It is also pretty heavy – weighing in at about 24 lbs when assembled. So your cat is probably not going to tip this over. To be honest I don’t think that even I can tip it over. With something so futuristic I was expecting it to be tricky to set up. But this was quite far from the truth. The box came with an instruction manual on disk. Basically set up consisted of placing the base on the floor. The base does contain all the electronics and holds the garbage bag where the waste will be deposited. Then the large dome is placed on top of the base station by having the guide track on the dome match up with the base. You also get a lip to place on the front of the dome which stops accidental waste going over the electronics. You can then pull out the draw in the base and fit a garbage bag. There are 5 tabbed holes to place the garbage bag into and it takes less than five minutes to fit in the proper place. The electrical socket is then plugged into the base and you can switch on. The front of unit has three lights and three buttons. The buttons are cycle, fill and empty. So cycle will allow you to manually run a cleaning cycle. Fill will place the dome in a position for easy litter filling. And empty will empty all litter into the base for a full wash and clean of the unit. So to fill I just pressed the fill button and this rotated the unit so two access flaps were on the top. I then just used a lever to open these and then filled with litter. You do not need much litter and there is a fill level on the dome. When you have finished filling just close the flaps and press fill again and it will return to the correct orientation. Basically when your cat enters the litter box their weight triggers a sensor. This can be seen with the lights on the front of the unit. When it is waiting for a cat the OK/Waiting light is green. When a cat enters the box the Sensor/Timing light changes to red. Once your cat has performed their ablutions and left the box the in built timer then counts down 7 minutes before the cleaning cycle starts. If the cat re-enters the box then the timer stops and restarts. Once 7 minutes have counted down the dome starts to slowly rotate. If a curious cat then tries to re-enter the box or just places their paws on the step then the rotation stops. The box will then wait 15 seconds before it resumes the cycle. But it will not resume if the cat is still in the box. During the rotation the flaps from earlier open and all the waste drops into the garbage bag below. 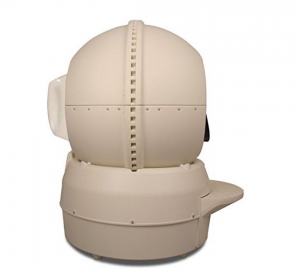 The dome then returns to the starting position and puts itself back into waiting mode. Sounds great in Theory but what about Practise? Well the manual does come with some tips for if your cat will not use the litter robot straight away. A number of cats will just jump straight into it but sometimes you get a more timid cat who will not use it straight away. Tips include placing it next to their current litter box. Placing some of their waste into the dome for them to understand what it is for. Sadly this does not work in my case as Dyson will not use a box with waste already in it. You can also use the litter from a current litter box in which to fill the dome so that they understand the smell. Another tip is to not clean their current litter box so they will be forced to try the litter robot. In my case my cats started to use this almost straight away. I did use some of the litter from a current box and I kept one other litter box available in case they decided not to use it. But once Dyson worked out that her waste disappeared quickly afterwards she used it more and more. My cats though were used to covered in litter boxes and this can also help them get used to the litter robot. If your cat never does get used to the litter robot then the manufacturer gives a 90 money back guarantee. The only negative here is that a cat needs to be about 5 lbs to trigger the sensors. Therefore you cannot leave the litter robot in manual mode for small kittens or small cats under 5 lbs. If you do have a kitten then just switch the unit off. Once that kitten has performed its’ ablutions, wait a few minutes for urine to soak into the litter then switch the unit on. The litter robot will run through a cycle now and the waste will be removed. Once the cycle has finished then the robot needs to be switched back off. This is a bit fiddly for when you have a kitten especially if you are going to be out all day and want the robot running in the meantime. Once the kitten is able to trigger the sensor though switch the robot back to automatic mode. This model of litter robot is also fine for cats up to about 15 lbs. There is a bubble version of this litter robot which allows for more space within the dome. 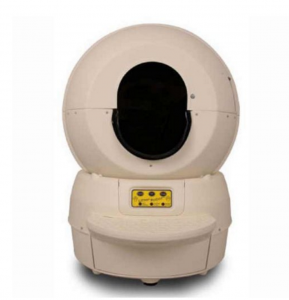 Also the Litter Robot III will be able to be used by cats bigger than 15 lbs. About once a week you just need to empty out the garbage bag. Just unclip it from the tags and tie it up and throw in the trash. Then clip in a new clean bag. You do not have to come into contact with the litter. If you have more than one cat you may need to empty the tray more regularly but it does hold a lot of waste. Once a month I wash out the tray (taking the carbon filter out first). Or I wipe it down with detergent wipes. I also wipe the entire outside of the dome. About once every six months I do a full empty of litter and then wash out the dome with warm soapy water. If you do wash the entire dome out then you do need to make sure it is completely dry before placing litter back in the dome. Otherwise the litter will stick to the sides or top of the dome. This is a little tricky as the dome is quite deep. 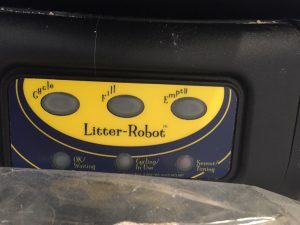 There is also a Bubble version of the Litter Robot LRII available. This bubble is a window at the back of the dome which gives you an extra 3 inches of space within the dome. Perfect if you want a slightly larger area. Well I now haven’t had to scoop a litter box in about three years. The litter box is still going strong and is still in a very good condition. I did have one small issue with the control panel initially but the manufacturer sent out a replacement within a day. They also sent instructions about how to fit the new control panel and it was all set up in about 10 minutes. Since then I have had no technical issues. My cats have used the litter robot each time and I use no other litter box. I currently though have a small kitten (13 weeks old). She arrived here a few days ago and within 5 hours was using the litter robot herself. I have had to switch it over to manual operation in the meantime as she is under 5 lbs. I love my litter robot (or the Death Star as family and friends call it). It is a cool piece of equipment with a very distinctive look. Whilst setting up my old house for rentals each management agent kept asking to see the Death Star. So it does get people talking. It definitely also cuts down the catty smell that you get in multiple cat households when cats don’t go out and use multiple litter trays. The one thing I wish personally is that the opening was a little bigger as I have a very large cat (ragdoll). But my previous cat was perfectly fine with the opening size. To be honest Dyson still puts all of her paws on the lip and just her bottom inside. But with the weight of this unit she never tips it over. I empty it out about once a week and that does produce an odor. But, I immediately put the garbage bag inside another bag and seal it up before taking outside. During hot weather I do empty the unit more often. Now I have the kitten as well I will probably empty twice a week. 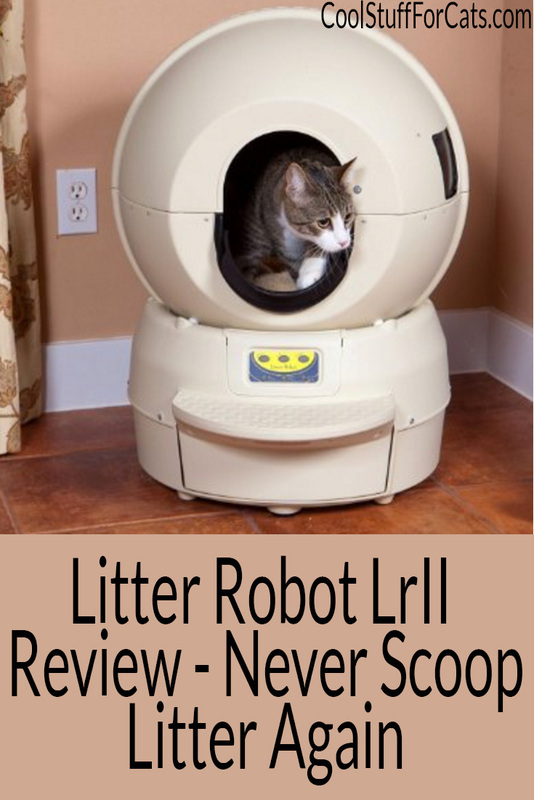 To never have to scoop litter again buy your Litter Robot LRII here from Amazon. there is a step up into it so it is quite easy to get into – I currently have a 13 week kitten climbing into it quite easily. It isn’t too loud – much quieter than other automated litter boxes. You just hear the rotation of the dome and mine goes off in the early hours of the morning and doesn’t wake me.Initially it helps if your cat is a bit further away from it before it rotates for the first time to get used to it – again it hasn’t scared my new kitten though. Oh my God, the litter box you shared in your article appears more like a royal throne for your kitty. It is a very impressing litter box without a doubt, your kitty will feel like a king or queen with a litter box like this one. It does look high quality and wort the cost, as long as your kitty will use it. You just never know about pets and pet products, many of the most healthy doggy treats my dog has not interest in them. Your cat is stunning, and certainly very regal perched on her throne!! Fantastic review, I don”t think there’s a question I could come up with (which is rare for me!! ), that you haven’t already answered. At one point I had 5 cats, so lots of scooping that’s for sure, but for some reason it’s not a job I ever minded. To be honest I can’t see myself buying a self cleaning litter box, but should I ever decide otherwise, I will certainly keep this one in mind. You should have seen what one of my former neighbours had – oh my!! I was taking care of their two cats a few years ago, and either the people had no idea how to set it up, or they wasted their hard earned money. Thank you for your comment. Dyson was just hamming it up for the cameras – she was annoyed we didnt photograph her best side. Oh wow five cats, I always thought my previous four was a lot. I found that being out all day made it a lot easier to think about self cleaning boxes. Dyson was annoyed I photographed her – she was basically wanting her privacy. Yep this has been going for just over three years now and we have had a house move as well. It is going strong with no scratches and is very reliable as the sensor always works. Wow, I never even thought you could buy this sort of product. I guess now that it’s 2016 anything can happen! There’s a lot of new and cool stuff getting released lately and this is a perfect example. An added bonus is that it’s so easy to set up, which it doesn’t look like it would be. Great review! The Litter Robot does look very futuristic and quite large. Where do you usually place it? I notice in your picture that it is in a bathroom. Is it water resistant? You’re right. The cost is rather high but as a cat lover, I understand that we want to give the best that we can to our feline friends. It’s also money well spent if the cats use it and like it. Yes this is in a bathroom which is used by just my cats. It could be placed in a utility room. The electrical cord is not water resistant but i have mine in a cable holder to keep it out of the way. You can get water in the dome but not on the front control panel. That is so cool! I need to share this post with my neighbor, she was just telling me the other day how she is getting tired of cleaning up the mess from the litter boxes for her cat. Her cat, like yours, doesn’t like using a litter box that has been used prior. I think this will be a great blessing for her and her cat. Thank you for posting this, I know she will definitely want to buy this. I think my cat would be going to the bathroom in a nicer environment than me. It kinda looks like NASA made a littler box. To funny. No matter how much it kinda looks like it could be a spaceship I kinda like it. It sure would make clean up easy. Who doesn’t want that? I am rich in kitties and need about 25 litter robot LRII self-cleaning litter boxes. What a brilliant idea! And for a small tribe, it would be perfect. My largest kitty may not fit, he’s about 22 pounds. No, he’s not fat, just fluffy! Does the Litter Robot LRII make noise? I would be concerned that it will scare the cats. they are very good for multiple cat households. Dyson always expects a clean litter box so the fact this cleans almost straight away is great for her. 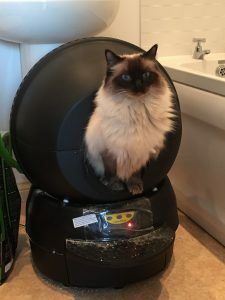 The Litter Robot LRII with bubble is good for bigger cats as it gives more space but there is also a Litter Robot LRIII now available with a larger opening which is great for extra large cats.